When I was in Pop-Tart's target market, the only flavors available were marginally breakfast-y ones like strawberry, apple, and blueberry. All of them were unfrosted. They were also forbidden inside our home. I had to beg my friends to share. 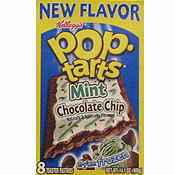 Now I see flavors like Mint Chocolate Chip, Hot Chocolate, Chocolate Chip Cookie Dough (! ), and Chocolate Chip Cookie. I guess they're not even trying anymore. Even the fruit-flavored Pop-Tarts were a stretch; now they've given up entirely and are just selling them for what they are: sugary confections entirely unfit for breakfast. But they were on a good sale, so I bought a box. I couldn't see a flavor like that and not buy it, if for nothing other than novelty value. I'll let you know how they taste.